Late Spring Front Range Snowstorm In The Making? There’s a reason we don’t like to jump the gun and post “outrageous” snowfall totals too far in advance, Colorado’s weather always has a way of humbling us. 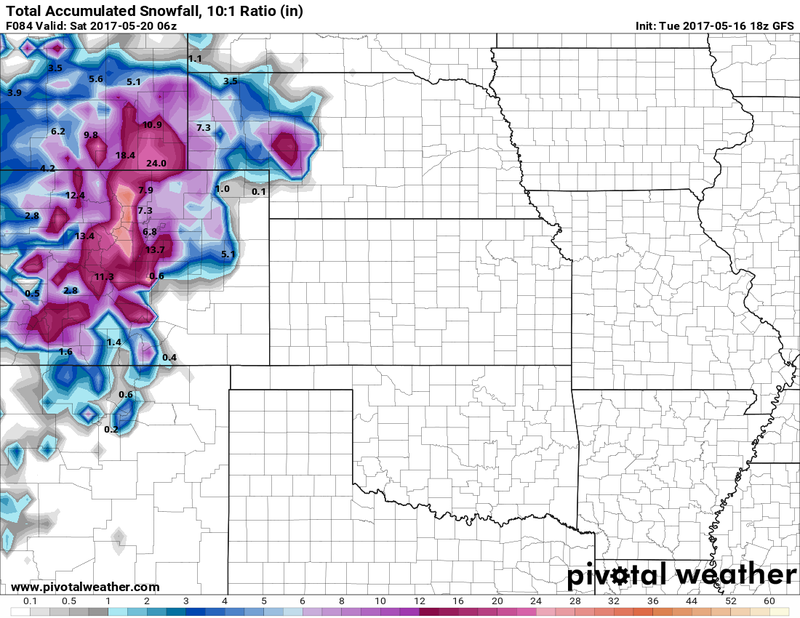 As I saw the models consistent last night with somewhere between 8-16 inches of snow for the Denver area… I didn’t see a lot else that supported it meteorologically speaking. Forecasting weather is much like a math equation, there are a ton of variables that have to be taken into account to reach the final solution, if you are only looking at one thing (models) without understanding the others (meteorology) then your final solution could be drastically wrong. That being said, anyone can read a model and post it online, but you have to understand the rest of the picture… models can help but they are only a small piece of the pie. If you want to forecast weather and only rely on models, you will be wrong most of the time. We’ve learned this several times this year with the past few spring storms, models showed big snow but not all areas got it. 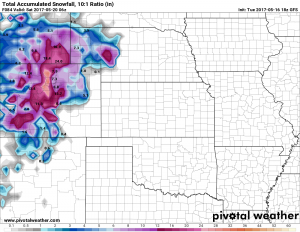 As discussed above, models were pretty consistent last night bring snow to the front range including Denver and Palmer Ridge areas. As of this morning’s latest run, we’ve seen a significant decrease in forecast totals for areas in and around Denver including South. Why is this? I believe the models are beginning to pick up on something I and many seasoned mets were expecting, this time of year it is difficult to get temperatures to play ball for significant snowfall accumulation. The temperatures with this storm are borderline freezing, meaning I see a lot of precipitation with this storm as of right now, even some snow but getting it to stick is going to be a task below 7,000 feet in elevation. 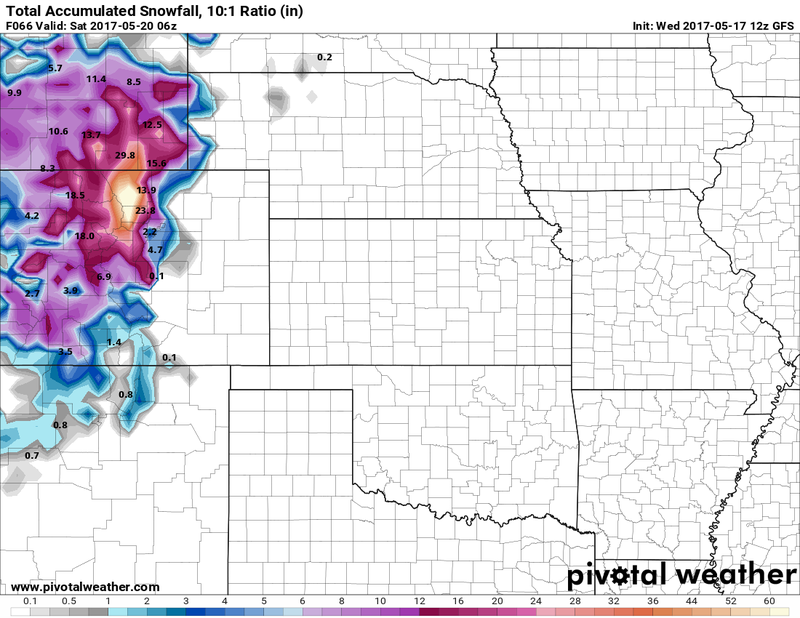 GFS total snowfall forecast through Friday night. 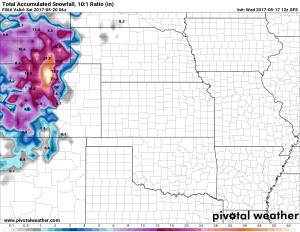 The GFS model pictured above sliced it’s snowfall accumulation totals well over half this morning for the entire urban corridor and Palmer Ridge area. This is interesting because this model actually has colder temperatures forecast than the NAM model. Models have overdone every spring storm this year so far, if big snow is predicted expect a pretty significant cut later in the forecast cycle. A lot of the cold air relies on the trough digging far enough South and as we move into spring that gets more difficult to do as the overall pattern of the jet stream is to move North. Long story short, as of right now nothing about this storm screams major blizzard or snowstorm for the urban corridor of the front range. The above bullet points plus a few other factors are why we are leaning with a lower snowfall bias for the Palmer Divide area. Speaking of closer to home along the Palmer Divide region, I see the best chance of snow accumulation South of Larkspur and North and West of Colorado Springs. Expect a chance of showers and thunderstorms as the system begins to move in later on Wednesday. Storms may have lightning and small hail, but overall severe weather is not expected in our area. At some point early Thursday morning continued rain may begin to mix with snow. Through the day Thursday expect rain and snow for higher elevations. Continued soggy conditions will linger through the day Thursday and into Friday. Most guidance has the storm’s energy moving out late Friday. Expect both Thursday and Friday to be soggy and cool days, outdoor plans will probably not be a great idea for both days. Castle Rock and Northern Palmer Divide: As most of this area is below 7,000 feet the 2-6 inch range looks most likely right now for snowfall. Do not be surprised to see this forecast make a move down to the 0-3 or 0-4 inch range though! Areas over and near Monument hill will see slightly higher snowfall accumulation likely in the 3-7 inch range, mainly for the highest areas in elevation. Winds will be generally out of a Northeasterly direction in the 10-20mph range. Travel conditions look to be most impacted over Monument Hill. Other areas may see a bit of slush accumulation so keep an eye out on those roads if driving about Thursday and Friday. Temperatures will be below freezing but don’t look to be at hard freeze conditions long enough to to serious damage. That being said, sensitive plants will need to be covered and above ground sprinkler system equipment would do well to be covered as well. Pictured: GFS surface low, temperatures and wind. Notice the cold front draped across Colorado out to the East. This storm still bears close watching as a last minute drop in temperatures could means significantly more snow for our area, but the odds are low and given what we usually see this time of year, very unlikely. 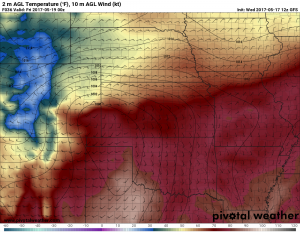 The good news is the storm looks to deliver quite a bit of moisture for the front range and we need every bit we can get this time of year. For snow lovers however, a lot of that may fall as rain or a mix that doesn’t accumulate to much. Stay tuned, we’ll have another update later in the day Wednesday with any forecast changes!